Mark the “Sneak Peek” Experiences and the Grand Opening Celebration events in December and January on your calendars, now, and plan to join us…and bring a friend! As you may recall, Cabrillo College received a sizable 2-year grant ($700K) from the California Community College Chancellor’s Office CCC Maker Initiative in July to develop a Cabrillo College Makerspace. The space will serve the entire campus and surrounding community with a mix of traditional (credit) and non-traditional learning and making opportunities (via Cabrillo College Extension Makerspace Memberships for the entire community) in a collaborative, fun, and failure-positive environment. Plan to join us for this fun event, including equipment demos, giveaways, refreshments, and a ribbon cutting ceremony at 3pm. 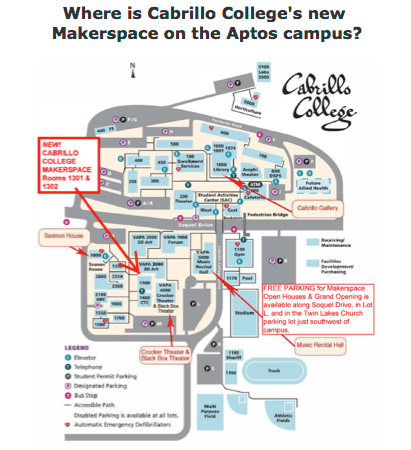 Parking for all of the above events is free in Lot L on Cabrillo’s Aptos Campus. If you are a member of the business or non-profit sector and are interested in hosting Cabrillo College Makerspace interns at your organization, please contact Courtney Cogan, Employment Services Specialist and Job Developer at Goodwill Central Coast: Courtney Cogan, Goodwill Central Coast, ccogan@ccgoodwill.org, Office 831-423-8611; ext. 8214, Cell 831-291-2233. Cabrillo College has partnered with Courtney and her team at Goodwill to work with you in connecting your organization with trained Cabrillo College Makerspace student interns. Meet Courtney and John Graulty, Cabrillo’s Dean of Visual, Applied, & Performing Arts & Makerspace Grant Project Lead, at the December 6, 2017 Santa Cruz New Tech Meetup, and learn more about Cabrillo’s new Makerspace, internship opportunities, and more. Off-campus/at work site experience – a traditional workplace internship experience in maker-related focus areas outlined above. Project-based internship completed in the Cabrillo College Makerspace for the internship provider. Work will be done by a single student or small team of students (3-4) working in the Cabrillo College Makerspace to complete project beneficial to the internship provider. The internship provider will provide evaluation and oversight, including, perhaps, special intern training on-site at the Cabrillo Makerspace. The Foundation for California Community Colleges (FCCC) has generously offered to pay for up to 20 hours of the internship and serve as the employer of record. The Cabrillo College Foundation (CCF) has also generously agreed to subsidize some additional internship hours. Additional hours beyond those subsidized by the FCCC and CCF would be paid by the internship host. Employers may also host unpaid internships. Credit and non-credit educational and enrichment programs, including individual community memberships made available through the Cabrillo Extension Division starting in early February 2018, will be offered to community members, faculty, staff, and students so that they might fully utilize Cabrillo’s new Makerspace. Those on and off campus seeking skill development for existing maker-related employment opportunities, new entrepreneurial ventures, or just a good time designing and making in a vibrant, fun space using cutting-edge technology, will find a home at Cabrillo’s new Makerspace.